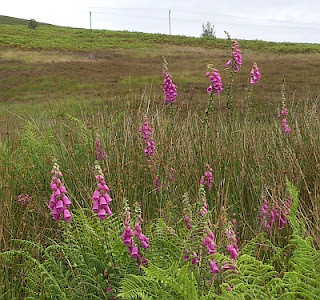 Today I went out with a group from the Scottish Wildlife Trust to Renton in Dunbartonshire to explore the area for flora and fauna around the Carmen Reservoir. The day started bright and sunny, but as the train arrived at Renton railway station at 10.35, it had turned cloudy and a little cold. Walk leader, David, was very knowledgeable on plants and wildlife and during the walk he pointed out many thing of interest which I would have missed if I had been walking by myself. 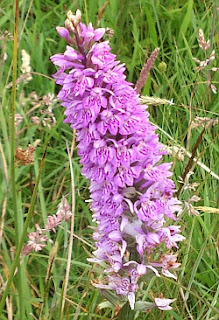 The soil around Renton has an underlying stratum of calcium carbonate and this is a suitable environment for orchids to grow. There were a large number of Common Spotted Orchids seen throughout the walk- there are one of over 50 wild orchid species in Britain. 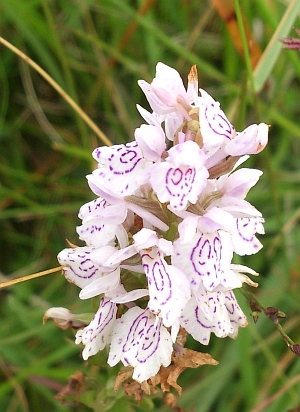 The close-up view of the petals below shows the pattern in greater detail. 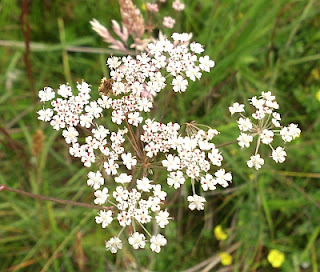 Another plant which David pointed out was Sneezewart. 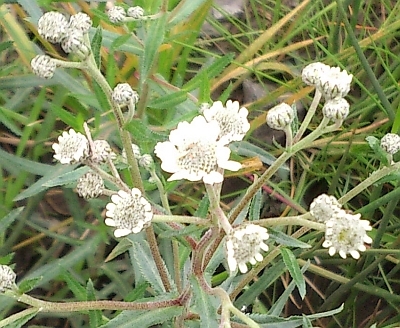 This plant has medicinal uses and the leaves can be eaten raw or cooked to treat a variety of medical conditions. The leaf is chewed to relieve toothache. The dried, powdered leaves can be used as a sneezing powder and as an insect repellent. 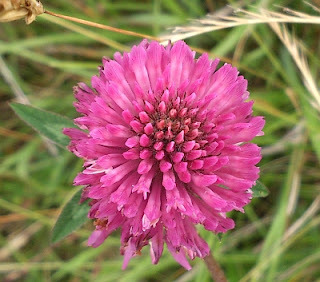 Another plant which can be used for medicinal purposes, Red clover, was also seen on the walk. This can be used to treat conditions such as whooping cough, respiratory problems and skin inflammations. It is also thought it helps to purify the blood by helping the body to get rid of excess fluid. This flower favours a westerly location and is found in west Scotland, Cornwall, south west Wales and south west Ireland. It favours damp conditions - the area around Renton is quite boggy in places and is a rare flower. 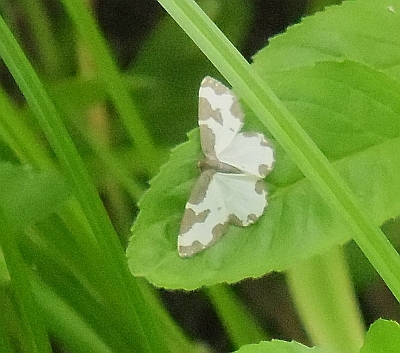 While on the walk we also saw a Kestrel, some Meadow Pippits and some butterflies and moths. 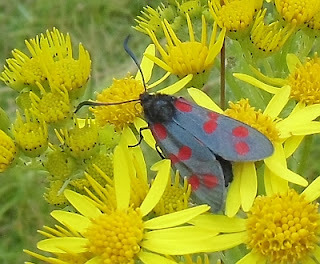 I managed to get photographs of two moths - Six Spot Burnet Moth and an unidentified one. The Six Spot Burnet Moth is a day-flying moth which can be seen between June and August. As the above photograph shows, it is quite an attractive moth. 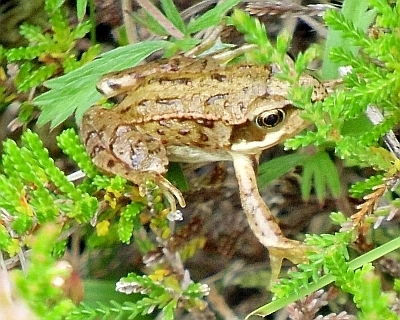 A baby frog was also spotted in the grass and I managed to get a photograph. It was tiny, but fortunately nobody stood on it. This is another rare plant found in boggy ground. It is common in England but very rarely found in Scotland. There were quite a few plants in a small area. 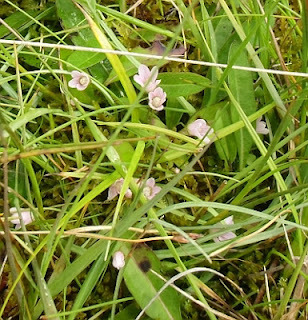 Another plant found in peaty soil. 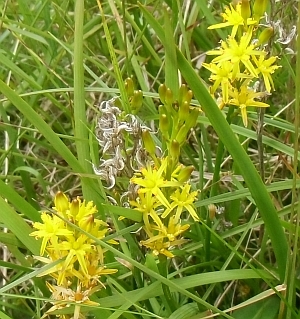 Bog Asphodel is also know as 'bone breaker' as it was once thought that if cattle ate it their bones would become brittle. However, this is more likely due to the plant growing on calcium-deficient soil than the plant itself. 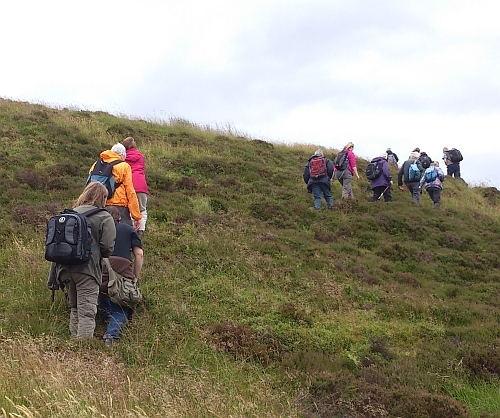 The walk was on very marshy ground and there were a few small hills to climb, but nothing too strenouous. 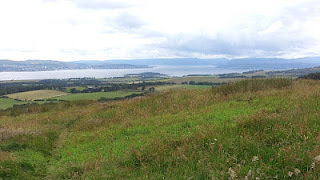 Excellent views of the River Clyde and the surrounding area could be seen from the higher ground. 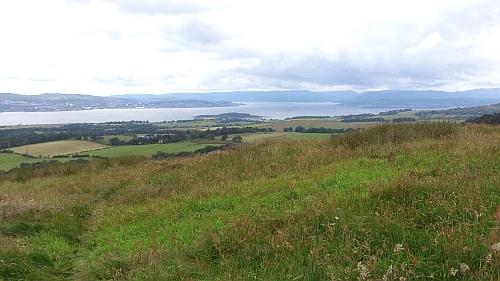 Greenock, Kilcreggan and Argyle were in view to the west. To the south, Whitelees Windfarm in Eaglesham could be seen in the distance. The walk concluded at Carman Reservoir. On the reservoir a pair of adult Coot and a juvenile were seen on the water, along with a Little Grebe.We then walked the short distance up the Renton to Cardross road and arrived back at the point where we had started earlier in the day. It had been an enjoyable and interesting day.